At Inspectioneering.com, we're able to gauge the popularity of various topics based on the amount of attention they receive. Because of this, we're able to identify subject matter that we should highlight in future issues of Inspectioneering Journal. Also, we're able to compile articles such as the one you are reading right now. I've crunched some numbers and have come up with the three most popular damage mechanisms, based on the activity of our readers, that Inspectioneering publishes information on. I've limited the list to these three mechanisms for the sake of brevity, but keep in mind that there are nearly a hundred different damage mechanisms that affect fixed equipment mechanical integrity in the oil & gas and chemical industries. There has been a push to better understand HTHA after it caused a fatal incident at a large U.S. refinery in 2010. It's hard to define HTHA in very simple terms, but it tends to occur in carbon and low alloy steels that operate above corresponding Nelson Curve limits. HTHA is a time-temperature-pressure function, meaning that the longer a piece of equipment is exposed to temperatures above its resistance limit in a certain hydrocarbon process environment, the more damage to the steel will accumulate; and the higher the temperature rises above the limit of the steel, the more rapidly the damage will occur. Furthermore, you can bookmark the HTHA Topic page on our website and check back regularly for updates and new information. CUI is one of the most well-known damage mechanisms in our industry, and yet it still makes up an inordinately large percentage of global maintenance expenditures. In simple terms, CUI is any type of corrosion that occurs due to moisture buildup on the external surface of insulated equipment. 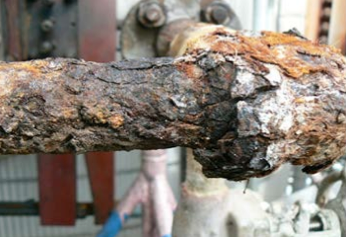 We published an article in the latest issue of Inspectioneering Journal titled Corrosion Under Insulation and Best Fit Solutions that provides a very comprehensive overview of the mechanism. Also, take a look at the CUI Topic page to see an aggregated listing of CUI information. And finally, API recently published API RP 583 Corrosion Under Insulation and Fireproofing which covers the design, maintenance, inspection, and mitigation practices to address external CUI as it applies to pressure vessels, piping, storage tanks, and spheres. The first edition of this recommended practice was released in May, 2014. High temperature sulfidation is another well-known damage mechanism because it occurs in large sections of plants. It is a result of naturally occurring sulfur compounds found in crude oil. In the absence of hydrogen, corrosion due to sulfur compounds in the crude is thought to occur at temperatures above 500F (260C). Up to that temperature, corrosion rates due to sulfidation are relatively low, even for carbon steels, unless there is naphthenic acid present in the crude. And again, keep up with the Sulfidation Corrosion Topic page to see the latest information and articles on this damage mechanism.